These Nissin noodles are Sukiyaki flavored. Sukiyaki is a Japanese meal similar to the Chinese style hot pot. Raw meats and vegetables are cooked in broth on a pot on the table and then each diner can grab from the pot and serve himself or herself. According to Wikipedia, the Sukiyaki broth is made primarily of soy sauce, sugar, and rice wine. This pack is also notable for its use of Udon style noodles which is very uncommon for Nissin. 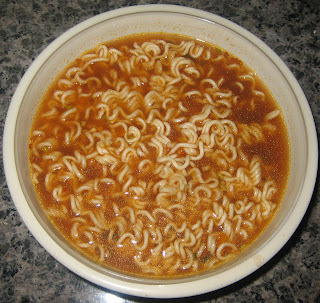 Nissin typically relies on their mainstay ramen style noodles which I consider to be one of the best in the business. I was very surprised to see the shape of the noodles upon making this ramen. Udon noodles are supposed to be very thick, round, chewy, and slippery. These noodles were flat and were most definitely not udon noodles. With that said, they were at least chewy and rather tasty, but I was disappointed not to get true udon style noodles. In the future, I should keep it in mind that true udon style noodles cannot be dried or they will completely lose their shape and consistency. Instant udon noodles are possible, but only in a vacuum sealed fresh configuration like in Ai Men Tsu's Udon noodles. The broth for these noodles was too sweet for me. It tasted like a typical Japanese udon broth except much sweeter. Perhaps this is what Sukiyaki usually tastes like, but it was still far too sugary for my taste. I prefer my instant noodles to be savory. The noodles themselves were interesting and quite tasty despite the fact that they are definitely not udon style noodles. 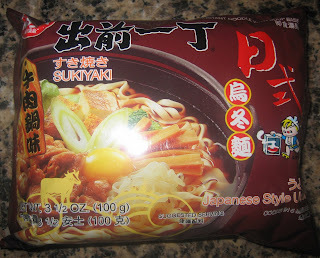 Maybe if you love Sukiyaki, you could give these noodles a try, but I certainly wouldn't recommend them. At first glance, these seem to be the same pack of noodles as the Nissin Demae Ramen Spicy Flavor that I found very disappointing. However, you might notice that the packaging is completely different, which led me to suspect these were completely different noodles. To be honest, I don't know what the difference is between the Nissin and Nissin Demae lines, but I suspect Nissin is manufactured in Japan while Nissin Demae is manufactured in Hong Kong. The American branches of Nissin products are called Top Ramen and Cup Noodle and I suggest you avoid those at any cost. I was surprised to see the vertical orientation on this bag of ramen, which is quite unusual for Nissin and ramen in general. I can't think of another flavor of Nissin that comes in this orientation. The picture looked quite appetizing despite the presence of an obviously undercooked egg. The packaging contains a beef theme as opposed to the seafood theme found on the Nissin Demae Spicy Flavor wrapper. 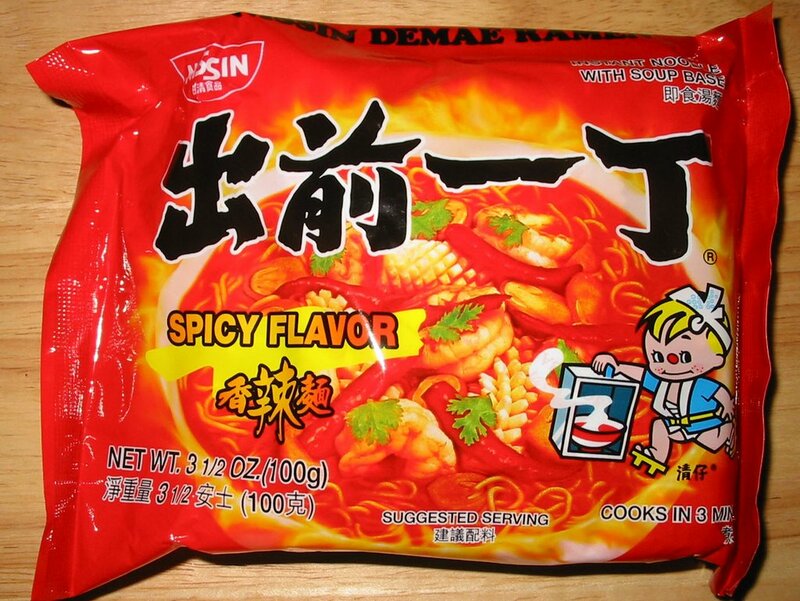 When I ate the Nissin Demae Spicy Flavor, my big complaint was that the broth was barely spicy. Thankfully, the Nissin Chili Flavor is very spicy even though the broth appears brown. The noodles themselves are Nissin's standard noodles, which seem to be the same whether they are from Nissin or Nissin Demae. 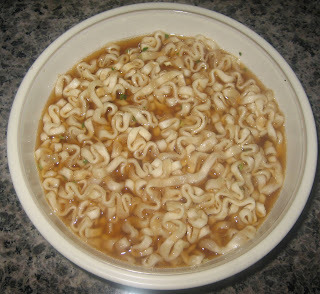 I like these noodles; I would characterize them as being slightly crunchy, medium thickness, and possessing a mild flavor. 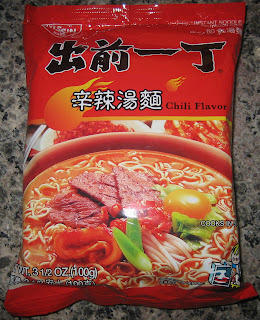 I recommend this flavor highly for someone that likes Nissin's noodles and is looking for a spicy meal to warm them up.